A natural orbital station is a habitat for humans to exist located on a natural satellite of Earth. It is true the Moon's environment is also an inhospitable and hostile environment. But with the presence of gravity and a soil surface there are options that do not exist for the artificial orbital station. General Stafford's Synthesis Group is not the first to study the Moon as a suitable operational crewed orbital station. Science Applications International Corporation (SAIC) generated such a concept in a 1984 report for the initial operational Moon base [SAIC, 1984]. The characteristic of such a station is that it does not require continual support to sustain a human crew over the operational life of the station, as given below. (1) The lunar station can be self-sustaining for food and water, given construction of pressurized transparent domes and soil-processing equipment. Automated operation can last from 10 to 20 years with nuclear power. This station can be a prototype robotic facility for eventual deployment on Mars [Bayon-Perez, 2002]. (2) Solar and space radiation hazards exist, but underground facilities negate risk, Figure 6.11. habitats near the lunar north pole (near the Peary crater) might be ideal, as they may be permanently illuminated, but enjoy a thermally benign environment [Bussey et al., 2005]. (3) Both external modules and below-surface facilities at least 1 m deep provide multiple inhabitable locations that undergo less temperature extremes and offer protection from damaging solar radiation, Figure 6.12. (4) Natural gravity about one-sixth that of Earth provides some gravitational force. Whether it is sufficient to trigger gravity-based beneficial physiological reactions remains to be established. The orbital and escape speeds are lower. (5) The beam-powered LightCraft and the magnetic levitation (MagLev) accelerator are both options and alternatives to pure rocket launch from the lunar surface. Figure 6.12. ESA concept for long-term lunar structures. comets exist. One of the chief components of the solar wind is atomic hydrogen (protons). Water seems to be present near the south pole. (7) Assembling of prefabricated equipment and structures from Earth is possible, Figure 6.12. (8) No space walks required; surface assembly uses mostly standard construction equipment. (9) Solar radiation and 3He mining are sources of renewable, aneutronic, fusion power (see Chapter 8). (10) Lunar facilities inhabitants can evacuate to sub-surface facilities or other surface modules in case of solar flares or other occurrences, Figure 6.11. (11) Return to Earth is free once lunar escape speed is reached and the spacecraft passes beyond the lunar sphere of influence. 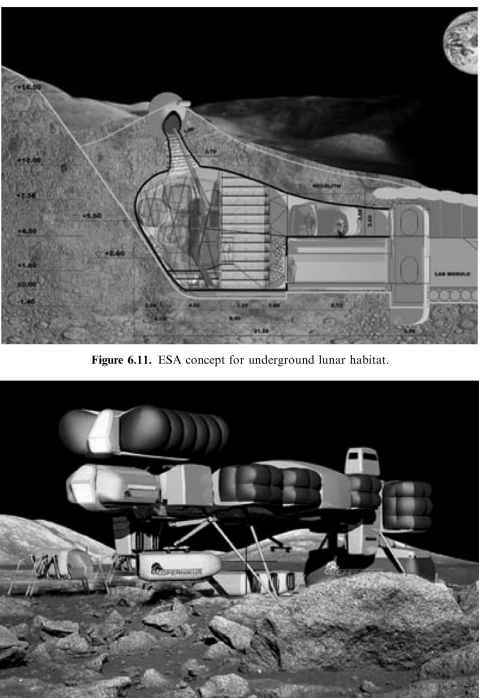 Figures 6.11 and 6.12 show both the underground and surface concept structures being designed by ESA and the Japanese Space Agency. None of these requires a technical breakthrough to be built. Available industrial capability in the United States, Europe or Asia can develop the first generation facilities and assembly equipment necessary to establish an initial operational capability (IOC). As more is learned about the lunar environment and surface conditions, systematic improvements can be incorporated. At the European Space Conference in Bonn, Germany, in 1984, where V. Gubanov presented the basis for Figure 6.6, the Japanese Space Agency NASDA (now JAXA) presented a comprehensive plan and an approach for returning to the Moon and establishing a permanent habitat. Unfortunately it had been too long since Apollo, and the engineers that for the first time created that which never was were not in attendance; the audience expressed severe skepticism about whether humans would ever return to the Moon. The approach and plan were well-thought-out and do-able, given significant engineering of practicable and operational Moon facilities. There seemed to be a misunderstanding between what is technically feasible (already demonstrated by Apollo) and what needs to be engineered as operationally practicable with our available industrial capability. Using the Moon as an operational base makes propulsion choices less costly and easier to make for deep-space missions. 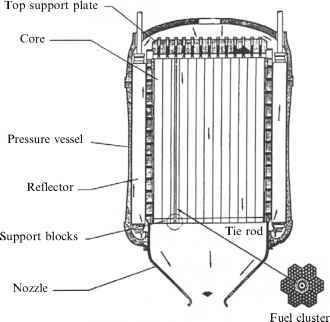 Spacecraft speeds on the order of 13,500 m/s (44,291 ft/s) are possible with non-chemical rockets with low mass ratios (1.4 with a nuclear rocket, instead of 20 for a hydrogen/oxygen rocket and 98 for hypergolic rockets), a first advantage. There is a clear advantage for testing and evaluating human operations on a foreign, inhospitable planet that is just 70 hours away, before venturing far from Earth without the capability of easy and fast return. General Stafford found that, on a per pound basis, the cost of liquid oxygen sent from the Moon to LEO may actually be less than if the same mass were lifted up from the Earth's surface. High-energy material (3He) recoverable from the lunar surface can power deep-space exploration and Earth-based fusion power plants when cryogenic, magnetic confinement reactors are available (see Chapter 8). For launches into our Solar System and for astronomical observatories on its dark side, the Moon is a natural choice. Using the Moon greatly reduces the magnitude of the resources required from Earth. Again, as in Earth orbit, the commercialization of sustained operations on the Moon is more practicable than if lunar missions are infrequent.